The NNLM Evaluation Office staff had a rare opportunity in early November. We had our first-ever, in-person staff meeting. Our staff members all work virtually from their offices in Georgia, Texas, and Washington. We traveled to Washington DC in early November to attend the American Evaluation Association, so we took a morning for a staff mini-retreat. This is our first all-staff photo, which we took in front of the AEA banner. Allow me to introduce you to the NEO bloggers. Starting from the left is Kalyna Durbak, Karen Vargas, me (Cindy Olney), and Susan Wolfe. Susan is our newest staff member, who has a special assignment with the NNLM. We will introduce her and her project in the near future. 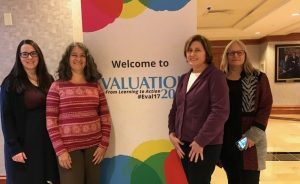 Look for NEO Shop Talk posts from Susan on topics related to participatory evaluation and culturally responsive evaluation. We are thankful for all of our readers and wish you a wonderful holiday. Cindy Olney is the Assistant Director of the NNLM Evaluation Office. She leads NNLM's evaluation efforts, designs evaluation methods, and guides analysis and reporting of evaluation findings.